The Trump Administration is suing California over a legislative hurdle that effectively prevents the federal government from selling public land to large oil and gas companies. The Justice Department announced on April 2 plans to challenge a state law passed in 2017 that allows California the right to intervene in the sale of federal public lands. The Trump Administration is arguing the law constitutes improper state interference. 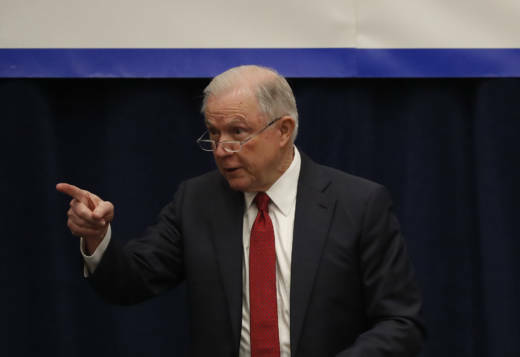 In a DOJ release Attorney General Jeff Sessions called the state legislation "extreme" and blasted California for causing the department to waste "valuable time and resources" in filing the suit. The law, known as SB 50, allows the state the right of first refusal in the sale of federal public lands, meaning the state can match the sale price that another purchaser has offered. If it chooses to forego the option, it provides the purchaser with a compliance certificate. The certificate allows the purchaser to record the transfer at the county land records office. While not invalidating the sale itself, the law prevents the purchaser from recording it with the land recorder's office unless California signs off. That can impact the purchaser's ability to sell the land or obtain a mortgage, says Eric Biber, an environmental law professor at UC Berkeley. While not a requirement, there are important reasons for why a landowner might want to record their deed. "The reasons you want to record your transfer is because you don’t want to risk losing your land to a subsequent transaction on that property," says Biber. "In addition, no bank will ever lend you money or a mortgage if you do a transfer without that land recording." The federal complaint alleges that California has already intervened in multiple land sales since SB50 was passed. Among those cited include the Army’s plan to convey public land in Alameda County to a developer for the purpose of constructing facilities. The Veterans Affairs Department in Los Angeles also wants to lease part of their land to create housing for veterans. Legal experts say California's law may be difficult to defend in court. The U.S. Constitution's Property Clause broadly restricts states from interfering with federal land disposal. In addition, the Supremacy Clause of the U.S. Constitution states that the federal law prevails over the state law if a conflict arises between the two. "That’s the essence of the whole system," says John Cary Sims, a constitutional law professor at the McGeorge School of Law. "So if the federal government says that racial segregation is illegal, then states don’t have a choice in whether they’re going to comply." The federal government's complaint also points to the act that formally admitted California as a state in 1850. In return for statehood, California promised not to interfere with the disposal of public lands. Several federal laws also provide for land disposal, say legal experts. California does not see the issue as a conflict between federal and state law, but as California’s right to control the environment. Nearly 46 percent of land in California is federally owned. When the SB 50 was introduced, Senator Ben Allen said it was aimed at protecting California's public lands from being sold off to the oil and gas industry. Some legal experts say California may have a case because of who the law targets. "The key thing here, at least from the state’s perspective, is that they aren't directly regulating the sale," says Biber. "What they're doing stems from this concept of land recording that has existed for centuries in this country." California will argue that they aren't regulating the federal government, only the purchaser. Environmental law professor Richard Frank says the phrasing of the statute is a "clever attempt" to avoid preemption by focusing on the purchaser rather than the U.S. government. "California may try to advance this argument but I’m not sure that’s a persuasive or powerful argument," says Frank. "A federal judge might well conclude that the state of California can’t do indirectly what the state can’t do directly." But Sims says it would all depend on the mechanics of the statute. "If it doesn't impair the actual sale, then who cares who buys the land from the federal government's point of view?" Sims says the court might look to the historical record to see whether federal policy reflects any preference for who can buy the property. "If California cares about who ultimately buys the land but there is no manifested federal policy that prefers one purchaser over the other, than maybe what California is doing is fine," says Sims. "Those who happen to sit in office may care but the law may not embody any federal policy about the purchaser." Certain federal laws on land transfers also require federal agencies to comply with state law, says Biber. "That goes to the state’s second argument — they would say, 'Sure, we are regulating you, but the law says we can.'" Among those laws are those aimed at conservation efforts such as the Federal Land Policy and Management Act, which applies to large swathes of the California desert. Legal experts point to a potential double standard, between the Trump Administration's position in this case versus their position on federal monuments. "In the context of national monuments, the Trump administration has argued that the federal government has a duty to transfer federal lands to the state," says Alex Camacho, professor of environmental law at the University of California, Irvine. "This issue of states rights has been levied by this administration to support states that fall within agreement with the Trump Administration." Professor Frank says while ironic, the practice is nothing new and refers to it as "situational federalism." "I think Republicans and Democrats both invoke states' rights when it involves their agenda. There isn’t a whole lot of ideological purity when it comes to the issue of federalism and states rights." Indeed, it was then-Texas’ attorney general Greg Abbott, who during the Obama administration, said "I go into the office, I sue the federal government and I go home." The pubic lands case is slated for initial hearings on August 13, 2018 in Sacramento.